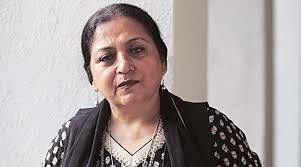 Madhu Purnima Kishwar is a Senior Fellow at the Centre for the Study of Developing Societies in Delhi. She is also the Founder President of Manushi Sangathan, an organisation committed to strengthening democratic rights and women’s rights in India. She is the founder editor of Manushi – A Journal About Women and Society, which has been published continuously since 1978. A recent focus of her work has been on the unfair laws and regulations governing the livelihoods of urban self-employed poor–street vendors and cycle rickshaw pullers.